No proprietary blends and full label disclosure. 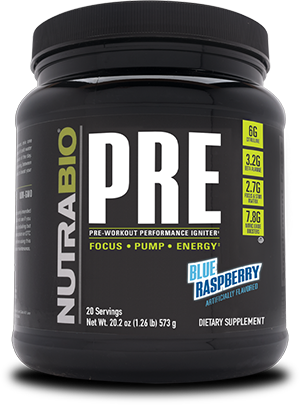 NutraBio® launched the first ever no proprietary blend, fully dosed preworkout back in 2002. For the last 16 years since, we've continuously improved this formula with a singular motivation: your gains. Packed with 27 grams of clinically dosed ingredients, PRE will push you further than ever before. Feel the difference that honest, transparent, fully loaded supplements will make in your training. Caffeine anhydrous and Infinergy Di-Caffeine Malate to boost energy, enhance focus, and provide greater training intensity. All without a caffeine crash. Carnosyn Beta-Alanine to increase endurance and help counteract fatigue caused by hydrogen ion accumulation. Pharmapure creatine monohydrate for greater strength, power, and muscle growth. Creatine MagnaPower for increased solubility and absorption. L-Leucine to help prevent muscle catabolism and lessen recovery time between sessions. Theapure L-Theanine. When combined with caffeine promotes enhanced cognition and attention. Huperzine A to promote a strong mind-muscle connection and supercharge mental focus. Betaine anhydrous to support creatine production, increase power and strength output, and protect cells from dehydration. Agmatine sulfate and Nitrosigine to stimulate nitric oxide pathways leading to greater vasodilation and bigger muscle pumps. Electrolyte and hydration optimizer that helps maintain water balance in the muscle, facilitates motor neuron function, and increase exercise capacity. Since day one NutraBio has never been happy maintaining the status quo when it comes to pre-workouts. We have always been the innovators; not the replicators. Although the industry makes it seems like non-proprietary blends, proper dosing, and scientifically backed ingredients are something new; the fact is NutraBio pioneered this trend over 15 years ago starting with our original PRE formula. We focused on creating the best, and we've done just that with our latest version of PRE. PRE has everything you need in one comprehensive, open label, clinically dosed formula and nothing you don't. We pride ourselves on purity. What you see on the label is exactly what you get. PRE contains no fillers, excipients, proprietary blends, or other potentially unhealthy or unneeded additives. At the end of the day, NutraBio isn't just about marketing hype and trying to maximize our profit. It's all about giving athletes what they want to meet their performance needs by giving them access to clean supplements that are innovative and effective. Like you, we want to train hard and see the results of our efforts. Compare NutraBio PRE to any other pre-workout on the market and ask yourself whose formula was created WITHOUT COMPROMISE. We think you'll find that even the most "self-proclaimed" strongest formulated pre-workouts pale in comparison to PRE. Game over. NutraBio PRE dominates the pre-workout landscape. Still not convinced NutraBio PRE will take your workout to the next level? Check out an independent review of PRE from the folks at Price Plow. Also read why PRE made it into PricePlow's 2016 best pre-workout supplement list. A closer look at the 18 ingredients and doses used to make NutraBio PRE the premier pre-workout on the market. Leucine is one of the essential branched chain amino acids (BCAA). By itself it can stimulate muscle protein synthesis; the process responsible for muscle growth and recovery. This is why it is often referred to as the "main" amino acid. Supplementation with at least 2/grams daily leucine has been shown decrease muscle soreness, lessen recovery time between workouts, and increase lean muscle mass. Howatson et al. (2012) discovered that leucine (combined with isoleucine and valine) administered before muscle damaging resistance exercises reduced indices of muscle damage and accelerated recovery in resistance trained males. Beta-alanine (BA) is a version of the amino acid alanine which serves as the precursor to carnosine (ß-alanyl-L-histidine) in skeletal muscle. Supplementing with BA is a highly effective means of increasing muscle carnosine content. Increased muscle carnosine helps buffer the negative side effects of hydrogen ion accumulation in muscles as exercise intensity increases. Beta-Alanine supplementation has been linked to improved exercise performance and delayed fatigue at higher intensities in both trained and untrained individuals in events lasting 1-4 minutes. Increases in lean muscle mass and muscular endurance have also been noted with supplementation. A recent meta-analysis confirmed the ergogenic effect of beta-alanine, showing a 2.85% increase in exercise performance compared to placebo when dosed at ~2/grams daily. Creatine is an amino acid (broken down protein) derived compound produced in the body that serves as the primary fuel source (ATP) for short duration, high intensity activities such as sprinting and weight lifting. Creatine is stored primarily in muscle tissue, and it is used for rephosphorylating ADP into ATP. This means that when our muscles use up our energy stores, creatine helps to replenish those stores in a fairly rapid manner. Approximately 2 grams of creatine are found in individuals that do not supplement and maintain a diet including animal based proteins. Those who do supplement can increase their body's internal creatine pool by 10 to 40% depending on diet and total lean muscle mass. As a whole creatine is arguably the most extensively researched and effective supplement available today. Over 500 studies exist of the ergogenic benefits of creatine supplementation with over 70% of these studies producing significant improvements in performance without any detrimental side effects. Creatine has been proven to increase lean muscle mass, maximal strength, power, and muscular endurance. Emerging research suggest creatine may provide cognitive and overall brain health benefits. Creatine MagnaPower is more soluble than creatine monohydrate and in theory should absorb better; requiring a lower dose to achieve the same ergogenic benefits as creatine monohydrate. The ISSN (International Society of Sports Nutrition) position stand on creatine monohydrate (CM) found that short-term CM supplementation has been reported to improve maximal power/strength (5–15%), work performed during sets of maximal effort muscle contractions (5–15%), single-effort sprint performance (1–5%), and work performed during repetitive sprint performance (5–15%). Long-term CM supplementation appears to enhance the overall quality of training, leading to 5 to 15% greater gains in strength and performance. Betaine, scientifically referred to as Trimethylglycine, is a metabolite of choline. Betaine's two main functions in the body are as a methyl donor and osmolyte. As an osmolyte, betaine protects proteins, cells, and enzymes from heat, dehydration, and other physiological stresses. As a methyl donor, betaine is used to convert homocysteine to L-methionine, and is therefore, a precursor to creatine. Doses of 2500-6000mg betaine daily may increase muscular strength, endurance, and total training volume. Betaine also plays a role in hepatic fat metabolism, promoting muscle protein synthesis, and has been suggested to increase nitric oxide levels. A study conducted by the University of Connecticut found that individuals supplementing with 1.25 grams of betaine twice/daily increased bench press power 20%. Malic acid plays a vital role in the Krebs cycle where it helps turn carbs, proteins, and fats into energy. If there is an inadequate supply of malic acid in the body the Krebs cycle cannot function properly which leads to premature fatigue. L-Citrulline is an amino acid that plays an important role in nitric oxide metabolism and regulation. It is converted to L-Arginine in the body to support L-Arginine and nitric oxide levels. Increased production of nitric oxide (NO) promotes vascular dilation which improves oxygen and blood circulation throughout the body. L-Citrulline is also expected to relieve muscle fatigue through ammonia elimination. A 2015 study conducted by Bailey et al. found subjects who supplemented with 6000mg L-Citrulline for 7 days were able to improve oxygen uptake and performance during high-intensity exercise. Agmatine Sulfate is a byproduct of Arginine through decarboxylation. It produces other byproducts that are involved in cell growth, structural and metabolic support to the nervous system. Agmatine has also been shown to manipulate pain receptors which may allow you to train past normal pain thresholds. Increased nitric oxide levels promote the relaxation of smooth muscle in blood vessels, increasing blood flow to working muscles. In pre-clinical studies nitrosigine was found to be more biologically active than arginine chloride. The research also showed enhanced blood flow during and after exercise which may help with muscle growth and recovery. Choline Bitartrate is formed when choline is combined with tartaric acid. This increases the choline's bioavailability and in turn, makes it more effective. When supplemented, choline bitartrate increases levels of acetylcholine in the body....a neurotransmitter that stimulates muscle contractions and is required for proper memory, cognition, and motor control. Increasing choline levels can produce a nootropic type effect as well as create longer and stronger muscle contractions. Caffeine, like creatine, it one of the most studied and proven ergogenic (performance enhancing) aids. Although caffeine can affect a wide variety of motor and mental functions it is most commonly used to improve endurance exercise, focus and cognitive performance, and improve energy levels. Caffeine has also been shown to have a thermogenic effect (heating/calorie burning) at rest and may increase the use of fats for fuel during exercise. Dicaffeine Malate, as the name implies, is the combination of caffeine and malic acid. Adding malic acid to caffeine is thought to calm the digestive effects of caffeine and thought to replenish the energy produced by caffeine (either through increased fat oxidation or ATP production). Malic acid may also weaken the feeling of a caffeine crash and slow tolerance development to caffeine. Caffeine can act to enhance alertness and vigilance during times of exhaustive exercise that requires sustained focus. Caffeine is an effective ergogenic aid for sustained maximal endurance activity, and has also been shown to be very effective for enhancing time trial performance. Caffeine can enhance, not inhibit, glycogen resynthesis during the recovery phase of exercise. Research suggests that L-Theanine's biggest supplemental role may be in taking the "edge" off of other stimulants. A combination of L-Theanine with caffeine is noted to be synergistic in promoting cognition and attention. A study conducted by Sun et al. (1999) reported that subjects who supplemented with Huperzine A for 4 weeks improved learning performance and memort compared to a placebo group. Taurine is involved in the regulation of core body temperature and may help prevent heat stress and stroke. Taurine is also acts is an osmolyte; assisting the body in maintaining proper water balance. Calcium, potassium, and phosphorus are vital electrolytes needed to maintain bodily water balance and facilitate motor neuron function. The combination of these electrolytes in CALCI-K are highly soluble and readily absorbed by the body. Electrolytes have been shown to prevent muscle cramps and are essential to normal muscular contractions. Sims et al. (2007) discovered that pre-exercise ingestion of a high-sodium beverage increased plasma volume before exercise and involved less thermoregulatory and perceived strain during exercise and increased exercise capacity in warm conditions. What is the best way to take PRE? Mix one heaping scoop of PRE into 12-14 ounces of water and consume 30-45 minutes prior to training. Can I take PRE with other stimulants (i.e. coffee, fat burners)? I see PRE has 350mg of caffeine. Is that amount safe? Generally speaking, yes. A large review by the European Food Safety Authority concluded that a daily safe dose of 400mg is safe for adults. We suggest not taking any other stimulants (like coffee) on the days you take PRE. We also recommend starting with a half scoop to assess your tolerance before moving on to a full scoop. I heard creatine can cause kidney problems and cause cramping. Is that true? Absolutely not. Creatine is the most studied and effective supplement ever...period. Over 500 studies have been done on creatine and none have shown to cause any adverse side effects. However, you should expect to see big improvements in strength, power, and endurance after taking creatine. What makes PRE better than other pre-workouts? A lot of other pre-workouts use ingredients that are ineffective or not properly dosed. All the ingredient in PRE are research backed and dosed efficaciously based on the current scientific literature.